One my favourite things in the kitchen is my slow cooker. We’ve had it for years and it’s a huge one. Sometimes I wish we’d got a smaller version but it just means I have loads of leftovers to freeze for those evenings when I cannot face cooking. They are not expensive to buy and with Christmas coming up, why not ask Santa. They are also very cheap to run. Now you might be put off by the preparation, and the recipe books I have do recommend browning meat in batches and simmering your onions, stock etc. But honestly? You don’t have to. We have had amazing results just from literally bunging in meat, roughly chopped veggies, some water, wine and/or stock and setting it going. No need to warm, no need to spend ages browning meat and coating it in GF flour. No need even to measure out liquids, I have got used to how much mine needs now so don’t even get the recipe book out. The last time I used it the beef hadn’t even defrosted, despite being out of the freezer for over 24 hours. I wouldn’t do this with chicken, but I had 5 minutes to get the blooming thing on for that evening’s dinner so I just chucked in the still-frozen beef, some red wine, onions, chunky hacked carrots, salt, pepper, bay leaves and one of those tea bags with herbs in (what are they called?) and turned it on. The results were AMAZING! Sometimes it can look a little runny. If that’s the case, just mix up some cornflour or arrowroot in a little cold water and add to the pot about an hour before you want to eat. You could also mix in some GF flour when you add the wine but it can go lumpy if you’re not adding slowly and simmer over the hob. I also put in a whole chicken – fully defrosted obviously – and it just falls off the bone when it’s done. Rub salt and pepper over the skin and just lob it in. No need for anything else. Sometimes I slip a few chunky slices of onion on the base under the chicken but often not. Works amazingly every time and it even browns the chicken! Save up the carcasses and freeze them in a bag until you have two or three then shove those into your slow cooker with water, some onion, leek, carrot, whatever you have to hand. This makes the most amazing stock. Then you just decant into containers and freeze for when you need it for risotto, casseroles etc. If you don’t have any bones or carcasses, ask at your local farm shop if they have some, they just throw out the bits they don’t use and will probably give it to you for free. Hey presto! Free uneneding suppliers of delicious, safe, totally freefrom home-made stock. 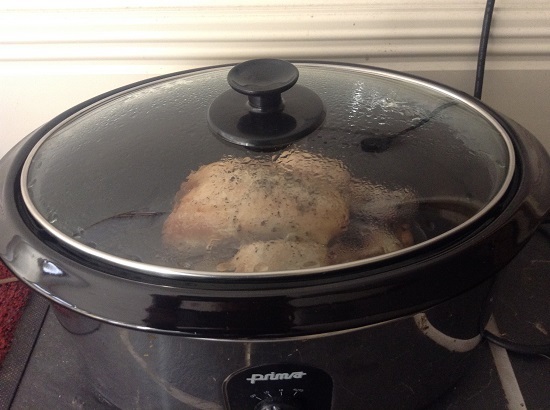 Anyone else in love with their slow cooker?